Beautiful photo! I'd love to see it in person. breath taking. it does give me a chill, it looks like ice! I can imagine the clear cold sparkle of a winter night lit by blue and purple light. What a beautiful capture. Very dreamy. Amazing picture. Love the blue/silver. Great shot! I've added your button to my blog, and left my blog details on your directory page - please drop by my WW! WOW - that is so beautiful!!!! This is so awesome. I really wanted to take the boys to Christmas town this year. Don't know if it will happen or not. Lovely. Would love to see it in person. If I remember right, my mom took my sister and I to Busch gardens when we were younger, it was in the summer though. Super cool... 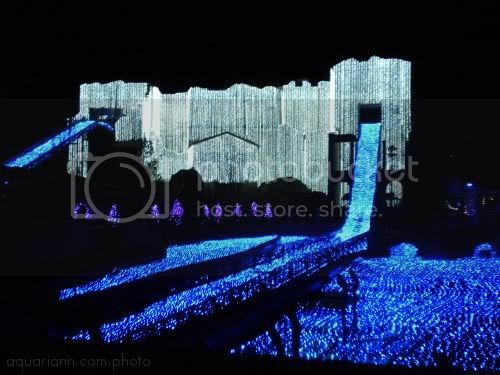 I wish they still had our trail of lights here!! Very pretty. I wish I could see it in person. That's a beautiful display. It must have been quite something to see it live! Happy Holidays! Beautiful photo. It has a very other-worldly look about it.